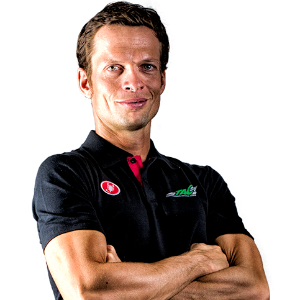 I'm a professional triathlete & Coach from Germany. My personal best at the long distance is 8:19h (Challenge Denmark). I started coaching several years ago when I got my exam in sport science. From that point on I tried to help fellow Pro's and Top-Age Groupers to get to next level and finish on the podium at big races or even become Pro. My biggest success as a coach is the national championship in long distance triathlon in 2017 (women) and several qualifications for Ironman Hawaii or 70.3 World Championship at age group level. My pro athletes finished sub 8:20h on the long distance several times (PB 8:13h) and around 3:50h at the 70.3 distance. My fastest age grouper finished 8:47h at Ironman European Championship. I use reverse periodization as a guideline with much success over the last years. The amount of training time in the European winter is less compared to a traditional training philosophy. Speed comes first during the winter months. Once we are just 3-4 months away from your A-race the sessions get longer and the pace gets closer to the race pace. Don't waste your time with junk miles in the winter! It won't help you to get fast in the summer! Speed comes first, then the long miles! Success. Coach Matthias Knossalla has been notified of your message. Ironman® Saisonvorbereitung; 23 Wo. ; Level: Top Age Group; deutsch; Startpunkt jederzeit möglich! To hire Matthias Knossalla as your coach, select the coaching service that is right for you.